How shall we proceed that our interior life may become more intense day by day, and thus be able to realize our ideal and fulfill our purpose in life? Now, I propose, not so much to give rules, or to make observations, or to suggest isolated helps, as to disclose the key that will basically resolve the problem. To this end, it will be a good idea, first of all, to state it clearly and precisely. There are periods in which the interior life becomes easy and sweet. Who has not had times, more or less extended, when he was able, without any difficulty, to live for days filled with fervor? The pity is that we have not been able to determine why or how we arrived at this state. One fine day, we perceived ourselves recollected; the presence of God became very easy for us; our soul was at rest, and we enjoyed a period of peace. But the next day, everything faded away, and we did not know how the fervor came or how it departed. And, unfortunately, since the bright days are few and the overcast ones are more frequent, we do not know, by a fixed rule, over many and long periods of time, what we must do to cultivate the in­terior life. Some souls even believe that fervor is a sort of lottery prize: he whose turn it is to win, wins, and he whose turn it is not, has nothing to do but to resign himself. If only we could discover the thread of this labyrinth, the key of the interior life, so that we might know what we have to do both on the bright days and on the cloudy and overcast ones! We might attempt to solve the problem in a superficial manner and enumerate all the elements whence the interior life takes its origin. For example: interior and exterior recollection; overcoming of self-love; purity of the heart, which ought to be empty of all created things; the practice of the virtues; and so on. Thus, the problem would be solved by saying that the soul must have and must intensify all these elements in order that the interior life might grow and develop. But the question would still stand, and the soul would ask anew: “How does one acquire recollection, empty the heart, and practice the virtues?” For many times, the soul desires recollection and cannot achieve it. Neither can anyone empty the heart perfectly except by filling it with God through the medium of the interior life. Nor can any­one practice the virtues perfectly except by holding before the eyes of the soul the divine Model, whom we contem­plate in prayer. Hence, we do not so much need to know the elements of the interior life and the means that favor it as to discover the key, the central point, that solves the whole difficulty. Where is this key of the interior life? May God be pleased to reveal the secret to us! This article is adapted from a chapter in Worshipping a Hidden God. Click image to preview/order. From this double aspect of charity, the love of God and the love of our neighbor, flow the two forms of the spiri­tual life: the contemplative life and the active life. The contemplative life embraces all our relations with God, which consist essentially in knowing and loving Him. The active life embraces everything that has a relationship with our neighbor; such things, for example, as the prac­tice of the moral virtues and the works of mercy. The love of our neighbor has a twofold aspect. One is to make use of our neighbor to go to God, using him as a means to unite ourselves with God. The other is to serve our neighbor. Thus, once we are united to God, we can descend to our neighbor to bring him the graces we have obtained in our contact with the Supreme Being. Inter­change with our neighbor is a profitable occasion wherein to exercise many virtues that bring us to God, such as hu­mility, mortification, self-abnegation, patience, and meek­ness. For this reason, St. Thomas says that, for achieving perfection, life with our brethren is better than the eremit­ical life; but as soon as one has achieved perfection, the eremitical life is better than life in company with others. And we have already indicated the reason for this, for it is our contact with our neighbor that gives us the oppor­tunity to practice many virtues. If we lived in the desert, we would perhaps not suspect many of our weaknesses. Our neighbor humbles us and thus exposes our pride and self-love; with his impertinences, he reveals our irascibil­ity or makes us practice meekness; with his manifold de­mands, he forces us to practice self-abnegation or brings to light our self-love; and so on. For this reason, spiritual writers say that the active life is the preparation for the contemplative life, because, in the former, we exercise the virtues that dispose us for the latter. But once we have ascended to the summit of the con­templative life, traveling up the side that is the active life, we come down on the other side, bearing in our hands the treasures of God to distribute to our neighbor. This is the apostolic life. There is no one who has arrived at union with God, at the plenitude of contemplation, who does not feel himself eaten up with zeal for the salvation of souls. Then he descends from the height of contemplation to the field of the apostolate to win souls for God. So, the contemplative life has God as its object; the active life concerns itself with our neighbor. When the active life is the overflowing of the contemplative life, it is called the apostolic life. And this is the most perfect, since it supposes the plenitude of contemplation and the perfection of activity; it is, as it were, a synthesis of the ac­tive life and the contemplative life. With respect to our neighbor, we have no need to con­template him, but only to serve him or to avail ourselves of him to go to God. With respect to God, on the contrary, we have only to contemplate and to love Him, for con­templation and love merge into one single divine effect: union with the divine. Hence, the interior life at its apex is the contemplative life. And far from being something monotonous and wearisome, it is most varied and inex­haustible: eternity itself will not be long enough to ex­haust the treasures of light and of beauty that are found in God; much less shall we be able to exhaust them in this world. There are some saints who appear to know only one thing, who on all sides see only one thing. Some regard only the nothingness of creatures and the “all” of God; others reflect only on this or that passage of the Gospel; still others fix their gaze on a mystery of the life of Christ or on an attribute of divinity. And it does not cause us wonderment that they do not concern themselves with anything else. Each of the mysteries of God, each of His attributes, each facet of His divine countenance, is sufficient to consume an entire life. In one manner or another, therefore, every interior life must in its final phase be the contemplative life. Well, then, to contemplate God, the first requisite is to encounter Him. And once we have encountered Him, we need to know the means whereby to enter into communication with Him. If I have a great desire to hear the lectures of a master, but if I do not know in what country or in what city he lives, the first thing I need to do is to search for him. And once I have found him, it is indispensable to know the language he speaks so that I may enter into communication with him. The same thing occurs in the interior life. All its secrets consist in this: to know how to find God and to know how to enter into communication with Him. All this seems to be the most simple and obvious thing in the world. For where is God? We do not have to ascend to Heaven to find Him. God is within us: “In Him we live, and move, and are.” The divine Goodness has wished to remain with us, in our heart and in the tabernacle. Yet despite bearing God in our heart, and living in a divine atmosphere, and having Him in the tabernacle, how difficult it ever is to find God! Is not this “not finding” God the great torment of souls? It seems that it should be an easy and simple thing to enter into communion with Him. Does He not speak all tongues? Does He not penetrate to the very depth of our hearts? We do not even have to open our lips: it suffices that we open our heart; it suffices that we love. Further­more, we know that He is ever seeking us, that He is eager to enter into communion with us. What mystery is this? How can one explain these apparent contradictions? God stands near, yet we do not find Him. We can enter into communication with Him in all manner of ways, yet we do not succeed in doing so. Here we meet with the key of the interior life. The ex­planation of these apparent contradictions lies in this: that our God is a hidden God, as the sacred Scriptures tell us. “Verily Thou art a hidden God.” And a hidden God must be sought. If there is a secret hiding place in a room, and if there is a person concealed in it, we do not encoun­ter him, even though he is near us. We do not even sus­pect his presence. Thus it is with God. He is a hidden God. He is present everywhere, but everywhere He is concealed: in the stars of the heavens, in the earth that supports us, in the air that we breathe, in the neighbors that surround us. But will we always discover God? As pertains to the saints, yes. They find God everywhere, and for that reason, some of them went into ecstasy before a simple flower, since they discovered God in it. We, on the other hand, need to make innumerable reasoning to know that He is there. As our Faith tells us, God lives in our heart. But sad experience teaches us that we do not always encounter Him. Why? Because, although He is there, He is hidden; and to find a hidden person, it is necessary to seek him. God is in the Eucharist in a special way, and of all the places where He is, there we encounter Him most easily. However, even there He is hidden. How often we draw near to the tabernacle without perceiving or feeling anything! Consequently one of the secrets of the interior life consists, not in knowing where God is, because we already know that He is everywhere, but in knowing that, wher­ever He is, He is hidden. Hence, the secret of entering into communication with Him is to find Him. The second secret is this: Once we have found God, how do we communicate with Him? Sacred Scripture tells us: “For my thoughts are not your thoughts: nor your ways my ways, saith the Lord.” Herein is the source of our difficulty in communicating with Him, for His thoughts are not our thoughts, nor are His ways our ways. Thus, God communicates to us through one way, and we walk in another. He has His manner of approaching us, and we do not understand, for in reality, we wish that He would communicate with us in our way. For example, we believe that as often as God communicates with us, we must feel it, since we cannot imagine that communication with a beloved person, as our Lord is, could be dry and barren. But since the ways of God are different from ours, ninety-nine percent of the times that our Lord comes to us, we do not feel it. And this deludes us, and we believe we can­not communicate with our Lord because we cannot perceive Him. To us, it seems that our Lord can have only a delicious sweetness and that, when He comes, we must, therefore, taste Him with the sweetness of the blessed. And some­times it is thus. The coming of our Lord fills our hearts with sweetness. But God does not always taste the same. He is like the manna; He holds within Himself all savors. St. Bernardine of Siena says that God has two savors: the savor of sweetness and the savor of bitterness. When we feel our heart heavy, it is also God who draws near; it is Jesus who communicates with us — no matter how poorly we understand that He also possesses the savor of bitter­ness. Well does St. Thomas say that all our errors in the spiritual life flow from this: that we wish to measure di­vine things with our human criterion, which is so puny and paltry. How often, when we think that we are most distant from God, we are most closely united to Him! According to my view, the secret and key of the interior life is this: Jesus is a hidden God; we must therefore seek Him. But in seeking Him, we must remember that the ways of God are very different from our ways. To know those ways and to seek God through them are the sole means of finding God and of uniting ourselves to Him. 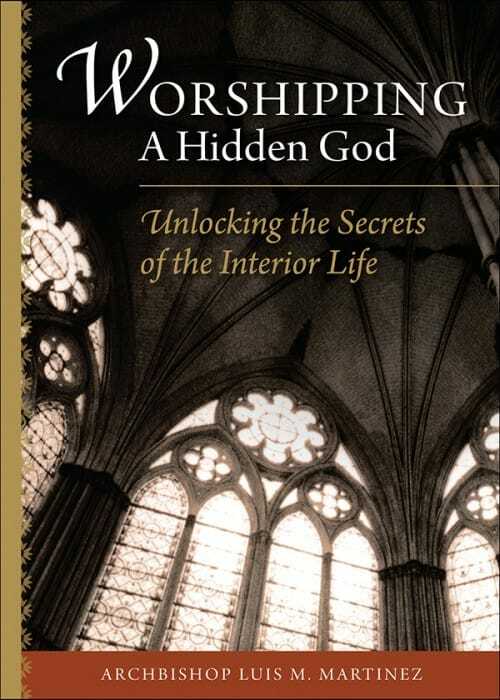 Editor’s note: This article was adapted from a chapter in Archbishop Martinez’s Worshiping a Hidden God: Unlocking the Secrets of the Interior Life, which is available as an ebook and paperback from Sophia Institute Press.